The schedule for 2014 New Economy Week included over 2 dozen events across the state, including film screenings, public forums, speakers, celebrations, and more. Click on the arrow next to each event to view more information. From October 12-27, The Happiness Walk will take Linda Wheatley and Paula Francis, both founders of Gross National Happiness USA, on a journey by foot from Washington, DC to Norfolk, VA. Along the way they will engage with the communities they pass through, collecting stories, discussing wellbeing, and talking about what is truly important in life. Follow along! Throughout their travels, Paula and Linda will be tweeting about their observations, good conversations, and the remarkable stories they hear along the way. Join in the Pursuit of Happiness Walk adventure with the hashtages #GNHUSA and #PoHWalk, and make sure to follow their account @PoHWalk! Vermonters for a New Economy is hosting a unique kickoff celebration this year. In the spirit of celebrating the New Economy underway here in Vermont, VNE will name a Vermont mountain for it. They have identified an unnamed mountain in Groton State Park and have filed a petition with the State Department of Libraries to name it Prosperity Peak. The celebration will begin with a hike up Prosperity Peak at 8 in the morning, with a goal of finishing in time for lunch at the Lodge at 1pm. Pre-registration for lunch and the hike is required. Please register by Tuesday October 7th if you want lunch – that’s the cutoff for reservations. Renowned ecological economist and speaker Dr. Joshua Farley will present a discussion and Q & A on economics for today’s world of finite resources. Dr. Farley is a fellow at UVM’s Gund Institute for Ecological Economics and also a fellow at the Post Carbon Institute. The People’s Forums will bring together candidates for public office with local community members, who will share personal stories about the interconnected crises we are facing and ask for candidates’ positions on issues such as universal healthcare, workers’ rights, climate justice, disability rights, state budget and economy. Participants will emphasize that we can no longer afford to compete with one another for public resources, and that our state must take a holistic approach and raise the revenue necessary to adequately address the crises in our communities and environment. These events are being hosted by the Vermont Workers’ Center, 350Vermont, Vermont Center for Independent Living, Green Mountain Self-Advocates, AFT-VT, and AFSCME-VT, as well as other statewide and local allies and partners in the labor, environmental, and disability rights movements. How can a public bank strengthen our communities and economies? Come to ask questions and hear from public banking experts including Dr. Thomas Keidel, CEO of the German Public Banking Association and Gwendolyn Hallsmith, Executive Director of the Public Banking Institute. The film, Wisdom to Survive: Climate Change, Capitalism and Community, comes to the Barnard Town Hall on Tuesday, October 14. The 7 PM showing is preceded by a classic potluck feast at 6 PM. Filmmaker Anne Macksoud will help lead discussion after the film is shown. If you are planning to come and can bring a potluck item, contact Chloe Powell at clovermont gmail com (clovermont gmail com) . This event is free, though donations are welcome. More about the film: The Wisdom to Survive: Climate Change, Capitalism & Community by local filmmaker Anne Macksoud accepts the consensus of scientists that climate change has already arrived, and asks—what is keeping us from action? In discussions with thought leaders and activists, the film explores how unlimited growth and greed are destroying the life support system of the planet, the social fabric of the society, and the lives of billions of people. More information: contact chris balevt org (chris balevt org) . Solarize Upper Valley is a program of Vital Communities aimed at making residential and small business solar photovoltaic (PV) energy more accessible across our region. Randolph-Brookfield-Braintree has been chosen as one of their targets for Fall 2014, so come celebrate the possibilities of solar and its positive impacts on our economies and communities! You’ll have the chance to meet our partner installer, learn about solar, talk with other interested residents, and sign up for a free site visit. More information: visit the Solarize Upper Valley page. Come enjoy pizza while watching Inside Job, an award-winning documentary about the causes and consequences of the financial crash of 2008. The film was produced, written, and directed by Charles Ferguson and narrated by Matt Damon, and it won an Academy Award for Best Documentary in 2010. Eric Zencey, Research Associate Professor of Political Science and a Fellow of the Gund Institute of Ecological Economics, will provide additional perspective and lead a discussion following the film. Hosted by Clean Yield Asset Management and the Donella Meadows Institute, Who Owns Vermont? Emerging Ownership Designs in Vermont’s Economy will explore Vermont’s leadership in implementing what New Economy writer Marjorie Kelly has called the “ownership revolution.” Marjorie will keynote the half-day event and moderate a panel discussion with local entrepreneurs and thought leaders on emerging alternative ownership models in business, land, energy and finance. Confirmed panelists include Gwendolyn Hallsmith, Executive Director of the Public Banking Institute; Paul Millman, co-founder of Chroma Technology; and Kathy Ruhf, Executive Director of Land for Good. Join a round table discussion in memory of Gary Murphy, an engaged advocate of the New Economy and member of his community who passed away this summer. The discussion will focus on some innovative ways to capitalize a public bank, ranging from home equity investors to cryptocurrencies. Join us at Main Street Landing for a free screening of “We the Owners: Employees Expanding the American Dream,” the award-winning documentary that takes a look at the diverse and inspiring ways in which a number of companies have shared ownership and responsibility to achieve common goals of having meaning and purpose at work, creating participative and empowering work places, and defining success beyond shareholder value. Hosted by Vermont Businesses for Social Responsibility in collaboration with Clean Yield Asset Management and the Donella Meadows Institute, this breakfast event will explore ownership as it relates to business. Ownership expert Marjorie Kelly will give the keynote address and moderate a panel discussion with local entrepreneurs and thought leaders on emerging alternative ownership models in business and finance. Discussion topics include best practices and lessons learned in business transitions to worker ownership, new approaches to business capitalization, the implications for ownership and control over mission and values, and new securities regulations that make investing in Vermont’s small businesses easier. Vermonters for a New Economy is sponsoring a talk by Dr. Thomas Keidel, CEO of the German Public Banking Association. All who have an interest in public banking, how it works, and how it might suit Vermont are encouraged to attend! Bring your musical instruments and voices to Bagito’s Cafe for a New Economy Singalong! We’ll be singing songs about peace, justice and sustainability. All are welcome! Following the screening, Marta Ceroni of the Donella Meadows Institute will lead a discussion about issues raised in the film, including the meaning of sustainability today and approaches for creating change in today’s world. Light food and drink will be provided. Cafe and coffee spot Maglianero will host a free screening of To the Moon, a documentary inspired by the U.N.’s declaration of 2012 as the “International Year of Cooperatives.” To the Moon follows the journey of eighteen college students who bicycle from California to Massachusetts in order to spread awareness about cooperatives, a business model they believe to be a solution to the volatile global economy. They confront frustrating realities while discovering their place in the world, and the results are at once chaotic, enlightening, and unforgettable. Following the film, co-op expert Eric DeLuca will lead a discussion. All are welcome to attend the Randolph Area Community Development Corporation‘s Annual Meeting. Come learn about new projects and lend your voice to improving your community! Location and time information TDB. Solarize Upper Valley is a program of Vital Communities aimed at making residential and small business solar photovoltaic (PV) energy more accessible across our region. Pomfret-Woodstock has been chosen as one of their targets for Fall 2014, so come celebrate the possibilities of solar and its positive impacts on our economies and communities! You’ll have the chance to meet our partner installer, learn about solar, talk with other interested residents, and sign up for a free site visit. Gund Institute for Ecological Economics Fellow Gillian Galford will discuss climate change in the context of Vermont. How is it affecting us as individuals, communities, and as a state? Come to learn and discuss challenges and change. Rick Tetzeli is the Executive Editor of Fast Company, the world’s leading progressive business media brand with a unique focus on innovation in technology, ethical economics, leadership, and design. In his keynote address, he will discuss creativity, innovation, and discovering ways to live and do business with purpose and meaning. 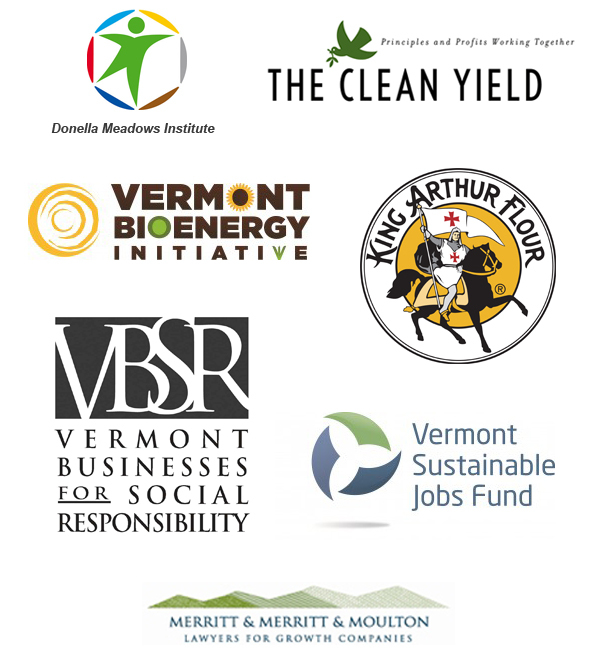 We are grateful to our sponsors for their support of Vermont’s New Economy Week 2014 and a more sustainable, equitable, value-driven economy. Please contact sarah donellameadows org if you or your organization would like to contribute to this community event.